SEATTLE, WASHINGTON, MARCH 27, 2017 – The 24-inch DenClarity dental monitor by Exorvision is a product designed specifically for the dental operatory that will significantly improve the dental office and the patient experience. The DenClarity displays high definition X-ray images for more clear diagnoses, while at the same time, is the only dental monitor with a built in-TV to provide relaxing entertainment. There is a growing trend to enhance patient comfort by promoting positive patient experiences, which, in turn, not only improve patient satisfaction, but also drive higher revenue. Many dentists find consumer monitors unsuitable for their practice, but the DenClarity is a perfect fit. The dental operatory is a Patient Care Area (PCA) that has special electrical requirements for monitors that are different than those of a regular office. The PCA is defined as 6 feet around the patient chair and 7 feet, 6 inches above the floor. Within this area, electrical equipment, including monitors, must be low voltage. DenClarity uses a low voltage 19-volt power supply to ensure the safety of patients and staff. A 120-volt consumer monitor far exceeds the safety levels as specified by safety codes in the NEC517 (National Electrical Code) and NFPA99 (National Fire Protection Association Health Care Facilities Handbook). DenClarity has a water-sealed screen, which can be wiped down with liquid disinfectants to keep the screen medically hygienic. Consumer monitors do not have a water-sealed screen, causing moisture to become trapped inside the monitor that builds up germs over time and develops a yellowish hue on the edges. DenClarity has a higher brightness at 400 candelas per square meter (cd/m2, unit of luminescence) that allows dentists to see X-rays more clearly and accurately. Consumer monitors typically have 250-300 cd/m2, which makes it harder for dentists to see distinctions in X-rays. The 24-inch DenClarity also has 60 percent more viewing area than that of a 19-inch consumer monitor. Its widescreen format creates a larger workspace to place content, allowing a patient’s charts and X-rays to be displayed on one screen, while freeing the dentist to complete other tasks, such as create a treatment plan. Using TV for entertainment as a diversion is one of the most cost-effective ways to reduce patient anxiety, especially among young children. TV programs can help capture a patient’s attention and turn their focus to more positive memories of the dental clinic. The DenClarity TV option also comes with a simple remote, allowing a dentist to seamlessly change the screen from X-ray to television at the touch of a button. 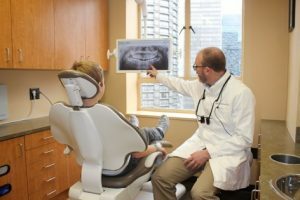 Dr. Thomas McKenny, a Seattle dentist, recently installed six 24-inch DenClarity dental monitors in his operatories and has since enjoyed the many benefits of the DenClarity. The DenClarity also comes with a 3-year warranty. Click here to watch a short video and learn more about the DenClarity dental monitor. About 15 years ago, a dental dealer came to Exorvision and asked if we could make a special LCD monitor for the dental operatory. We worked with engineers to come up with a prototype, and after much engineering and testing, a dental monitor was born. 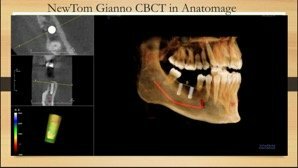 As digital dentistry advances, more dentists are using CBCT scanners or Cone Beam machines to take 2-D or 3-D images. We provide dental monitors that allow dentists to see images and video more clearly in order to help them diagnose more accurately. Today, Exorvision serves seven dental schools and hundreds of dental operatories.